From the creators of The Old Hotel at the 070707 UpStage Festival. Warning: language in this show may offend. 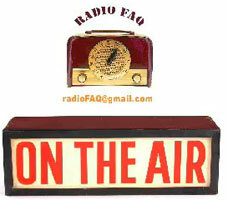 Grand Uncle on Radio FAQ, the missing Michael J Finch, the mysterious Esmé, and 8yr old Heather from New Zealand. Will they ever get it together?? voices: Doug Leonard as Grand Uncle, Suzon Fuks as Esmé, Miljana Peric as Gisela, Morehu Solomon as Peter Smith, Scotia Monkivitch as Kathy, Helen Varley Jamieson as Heather’s mum, with Tara Rebele, Elisabeth “Lizzy” McBain and Brynne as themselves. Allow extra time to load this stage. “RxEgo-Go” explores the role of medi(c)ation in a symptomatized, technologized society. When “I” is prescribed a digital ego to regulate her idiosyncrasies, “RxEgo-Go” and her sidekick “Teleprompter” turn on and take over. “I” is thrust into unfamiliar medi(c)ated territory, and finds herself at the center of a live online performance. How will “I” fare with her new technological ego? The audience decides. Miljana Peric, Teodora Peric, Jelena Milosavljevic-Rubil, Julijana Protic, Goran Rubil. 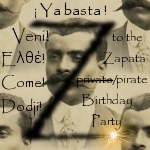 Our private/pirate performance is participative cyber dedication to the birthday celebration of Emiliano Zapata. 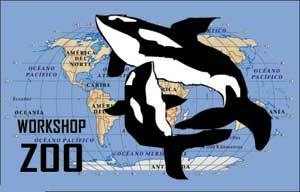 It will be organised in the ATMoAsphere of a creative and common gift economy practice. This means that Automated (story)Teller Machine of Author, as a part of traditional artist / musician performing, will be audio-covered with participative cyberformance of partysans who are free to Come! to listen and play music, make some noise, to clap, chant, chit- and cheat-chat in the name of Zapata, or just in their own name. Entry/ism is free, but non-entering could cost us a lot; so, should we still/silently ask ourselves – is there a vice versa? Noxiterra is a miniature biome whose key parameters (light, water, temperature) are based on climate-warming data drawn from the internet, and which is also designed specifically to function as a stage for improvisational performance using various kinds of avatars. What happens when the performative environment (i.e., the Noxiterra biome) becomes dominant rather than mere background; when it has unpredictable features that require responsive reactions from its ‘inhabitants’? Read more about the project on Antoinette LaFarge’s site. Merznet/ is a hyperformance adaptation of the work of German collage artist and author Kurt Schwitters. Two of Schwitters’s sound poems and one of his narrative pieces will be woven together to form the script: Nießscherzo, Husten Scherzo and The Causes and Outbreak of the Grand and Glorious Revolution in Revon. Joining the digital and the organic, the rational and the absurd, this live digital collage will create a new kind of computer virus and twenty minutes and five seconds of joyous confusion. They must be curious trees indeed, where the big elephants go walking, without bumping each other! Ladies and gentlement, get in quick to place your bets! You’ll be on the edge of your seats watching this exciting race! With improvised input from the 080808 performers. From the creators of The Best Air Guitar Album in the World, Vol II at the 070707 UpStage Festival. A live audiovisual mashup of popular love songs and Hollywood romantic comedy films. The two anaesthetists have now been reunited in RL – the last time they performed this open heart surgery operation, they did so from opposite sides of the planet (Dan was at Goldsmiths University in London, UK, and Paul was in an internet cafe in Taupo, NZ). This operation will be performed live from the Engine Room in Wellington, NZ. 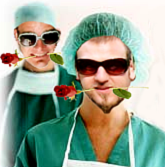 We wonder how they will get on in the same operating theatre as one another? The project reflects about identity through a story telling avatar (the artist’s avatar). 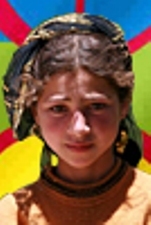 She will narrate her story as one of the Amazigh, and by that, she will question and discuss with the audience the identity problem; what is identity, it’s necessary to know our identity, can we have false identity and live with it? Can we have a double identity? The graphics of the project’s interface will consists of many photos related to the history period shown in the performance. Bridges mark great moments in the flowering of two cities: New York, where I was born, and Munich, where I currently reside. In 2008, both cities will celebrate significant anniversaries. 850 years ago, Munich rose to power when Henry the Lion destroyed the bridge over the Isar in the nearby city of Friesing, thus diverting the wealth and power of the salt trade from Freising to Munich. 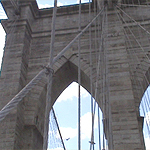 125 years ago, the inauguration of the New York-Brooklyn Bridge linked the two largest municipalities of that time into the modern City of New York. “Water Under the Bridge” will juxtapose these two stories of origin: through the destruction or the building of bridges. Telling the story on Upstage is conceptually significant, because the great cultural constructions of our own time, the cities of the imagination, are virtual. … a group of texts that mark one individual position in the society because the child learns gradually in order to get socialized and to accept social clichés, institutions and structures, norms and rules, emotional expressions of others. Only with this experience the child becomes able to fill in the book of texts that mark it. In this “mythical period” we should be taken by the children just as we have taken them, through games that are the essential part of growing, but also of the life itself. Support from: Ana Vilenica, Marijana Cvetkoviç and Biljana Popmijatov. Three portraits that draw a line between three artists working today in three different countries of the world (the horizontal timeline), and three artists working in those same three countries 100 years ago (the vertical timeline). By experimenting with everyday, universal actions that span those timelines (i.e. walking, brushing hair, eating soup…), we gain the capability to see ourselves in the other, throughout history and across borders. These portraits are of: (1) Latife Usakligil, a social and political woman-rights figure from Istanbul, Turkey. Researcher Damla Hacaloglu, who investigates woman portraiture as subject of relationship, interplay, effect and sense, while following Latife’s life and the choices that she made. (2) Prudence Heward, a painter from Canada from whom researcher Cathia Pagotto explores subject vs. environment – questioning the idea of belonging and subjectivity. Her point of entry into Prudence Heward’s work is in her portraits of women; of particular interest is her portrayal of them as unsettlingly assertive within their surroundings. Heward’s subjects stare confrontationally at their viewer with their native landscape at their back, simultaneously exhibiting their lives and protecting/defending/claiming them; and (3) Laurinda C. Andrade, a Portuguese immigrant to New Bedford, USA, for whom researcher Marcela Oteíza explores the role of immigrants within contemporary nationalistic frames and cultural conventions through performance and technology; raising the question of identity and the perception of “the other” through a real and virtual presence of the performer in the space and its relationship to the body of the audience.